ShareOffice - Create, Manage, and Share Sales and Marketing Documents. ShareOffice provides secure intranet or extranet functionality to automate business-critical approval and signature workflows - internally or with partner relationship management. Features include full-text search, version history, server sync-up, email updates, audit trail/analytics, and check-in/check-out. Document Management: Centralize documents in a multi-level folder structure with full text search, version control, and tagging so the best content can be found every time. 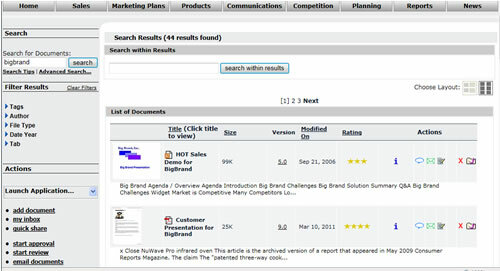 Comprehensive Search: Enables users to find files by field-level criteria (such as description, author, date, tag) as well as by text content. Collaboration: Allow multiple users to work together on documents on a global basis. Control Access Rights: Make subsets of files available to designated outside parties. Access is protected via strict security and encryption, except for files that you make available for public download. Administrative Features: Site configuration, self-registration for new users, mirroring between ShareOffice and a local file server, and a comprehensive audit trail. Security: Secure and robust with SSL encryption and hosted in a SAS 70 Type II data center providing industrial-strength security and redundancy. CRM Integration: The best online office app available in the salesforce.com AppExchange as a multi-way enterprise mash-up with deep salesforce.com and Oracle CRM On Demand integration. E-Signature: Users can send documents out for electronic or written signature directly from ShareOffice using EchoSign. Cost-Effective: Enterprise document management for a low monthly fee. Desktop Integration: Users can easily open and save documents directly from any desktop application using the on-demand document repository. On-Demand Document Editing: Users can open an on-demand document in its native application, edit it, and save it directly into an on-demand document repository. Offline Synchronization: Users can select one or more folders of content that will be synchronized for offline use when traveling or on the road. Any updated documents will be automatically uploaded or downloaded when reconnecting to the network. Batch Upload: Users can upload multiple documents at once with background uploads. Batch Download: Users can download multiple documents at once with background uploads. Local Backup: All documents from the on-demand document repository can be backed up locally to a server at the click of a mouse or at a scheduled time. ShareDrive is used in conjunction with ShareMethods, ShareOffice, ShareSpaces, or ShareNow.